(Granville) Hopkins Township HS "Hornets"
Granville (population 1,414) is located in north-central Illinois in northeastern Putnam County. The town is located on Illinois Route 71 just west of Illinois Route 89. The Conrail Railroad passes through town as does two branches of the Allforks Creek. Hopkins Township High School in Granville was created in 1916 by the voters of the communitites of Granville, Standard, and Mark. 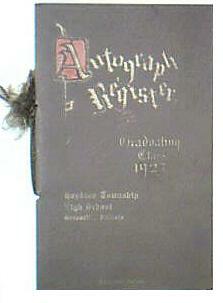 It was not until 1917, however that the school was official recognized as a Township High School. 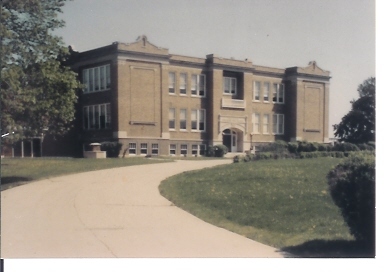 Classes began that fall in the Granville Grade School building, however, later moved to the second floor of the post office. This was done while construction had started on the new Hopkins Township High School building. 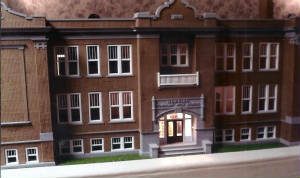 The $40,000 building was constructed on the north side of Granville. It was finished and occupied in December of 1918. If the Class of 1916-17 is counted as part of the Hopkins High School graduating classes, than Hopkins High would go on to graduate exactly 50 senior classes (1,329 students) in her rich history. The Class of 1965-66 would be HTHS' final graduating class as a consolidation effort with Magnolia-Swaney High School brought forth the newly created Putnam County School District. 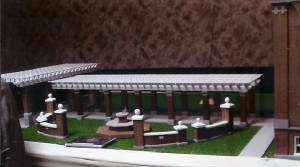 The Hopkins High School had many unique attributes including a pergola and colonade on the west side of the building. 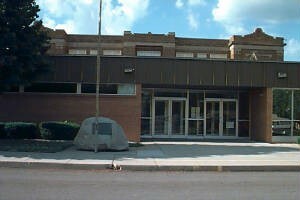 This was replaced in 1950 with a new gymnasium. Some less-than-nostalgic thinking in the mid-1970's saw a grade school structure built in front of the Hopkins High School building, blocking its beloved stately look. This led to the Hopkins Township High School building eventually being relegated to storage use only. Weather, elements, time, and lack of use saw the building eventually fall into a sad state of disrepair. In 1998, it was decided to demolish the the once thriving and memorable building. 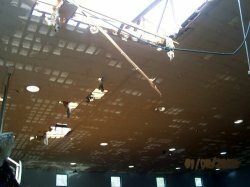 June 23rd of 1998 saw the beginning of the building's destruction by a professional wrecking crew. The only building of the original structure that was spared was what was known as "the old garage." This building was put to excellent usage as a museum honoring the Hopkins High School history and memories of those who attended school there. Congratulations to the dedicated alumni of Hopkins High in their attempts to keep the memories of their school and their childhood days alive for generations to come. Granville Hopkins High offered boys' basketball and track as well as, quite likely, baseball as a member of the Tri-County Conference. The Hornet boys excelled in the 1940's. 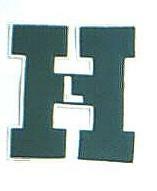 If you have any further information regarding the athletic program at GHHS, please send us an e-mail. The Hopkins High School boys' basketball team was on fire in the 1940's! Overall, the team produced five Regional titles and two District titles. Between the years of 1940 and 1947, the boys were IHSA title winners in 6 of the 8 seasons they competed. The years and titles won are listed below. In addition, the Hornets also won seven Tri-County Conference Tournament titles and took second on three other occasions. Unfortunately, the team records and coaches' names for these and other great Granville Hopkins High School teams are not available. One game in particular for Granville Hopkins High School will forever be recorded in the record books. 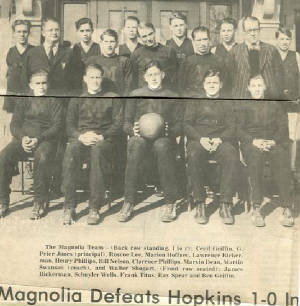 On November 20, 1929, the Granville Hopkins boys basketball team lost a real squeaker to their rivals from Magnolia by a score of, are you ready for this, 1 - 0 !! This game is recognized by the IHSA (www.ihsa.org) as well as in the National Federation of State High School Associations Record Book as tied for the lowest scoring high school basketball game of all-time!! A newspaper article regarding this historic game can be viewed below. 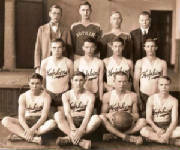 The photo to the right is of the team that played the school year of 1928-29. Dino Paganelli, is seated in the front row, second from the left. Can you name any of the others? The all-time scorer in Hornet history is Fran Aimone, who played from 1955-59. In four seasons, the 5'11" sharpshooter scored 1,473 points, 509 came in his final season (good for a 24.2 scoring average), and he set the single-game record with 51. Aimone also scored 30 or more points on seven occasions in his prep career, and started in 73 consecutive games for Hopkins. This information was found in a book titled "March Sadness: Broken Dreams and Unrewarded Talents" by Walter A. (Sonny) Ziel (published in 2003). "Field" was the key word for two Granville Hopkins HS boys. In consecutive years, Hopkins High was represented at the IHSA State Meet, with two individuals bringing home medals. Their great accomplishments are listed below. 1924-25 H. Fielder Discus "B" Meet STATE CHAMPION!!!! !